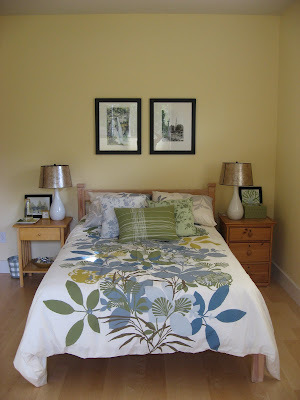 With the weather finally down into the 80s and 90s, we're venturing back outside for exterior projects, but we're not opposed to crossing indoor tasks off the list whenever the opportunity presents itself (as I wrote about here), and the guest room has been on the receiving end of that effort lately. The one on the left is a pen-and-watercolor piece we picked up on Kauai during our honeymoon cruise (and finally put in a frame after nearly nine years), and the right is a picture of my college campus that I took, developed, printed, and matted myself in a photography class. I don't love the imbalance between color on the left and black-and-white on the right, but I have a plan to deal with that.